Save offers as passes in the wallet for future use. Apple Wallet is an iPhone app that digitizes all credit cards, tickets, rewards and coupons. Essentially, you can use it as a digital alternative to a real wallet. How to leverage Apple Wallet for beacon campaigns? Users with iPhones can now save beacon markdown cards in their Apple wallet, so as to easily redeem any reward or discount when they wish to. Markdown cards (card creatives on Beaconstac) now have a clickable option to “Add to Apple Wallet” at the very bottom of the card. On selecting this option, the pass will directly save onto the user’s Apple wallet, with the beacon programmed within. This is how a generic Apple Wallet pass would look. The structure of the pass depends on the content within the markdown body. 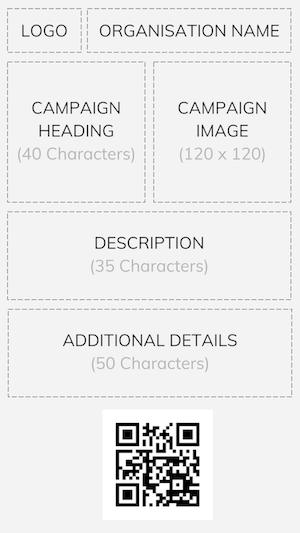 The pass fields are populated based on character limits and image size restrictions, mentioned below. In cases where the markdown body has no content, the structure of the Apple Wallet pass is populated according to the content under Eddystone Notifications. Logo: This will appear on the top left hand corner of the pass. The logo will be the same as the icon that you set in the eddystone notifications. The allotted space for a logo is 160 x 50 points. The logo will automatically be resized if it exceeds the allotted space. Organization name: The organization name can be seen on the top right corner of the pass. Campaign Title: The title appears on the left hand region of the body. It consists of the first “#|##|###” tag within your markdown body. The preferred length of the primary field is 40 characters, as any length exceeding this would alter the size of the text. Campaign image: This image will be seen to the left of the title. It is the first image that is used in the markdown body. The allotted space for a thumbnail is 120 x 120 points. Description of the campaign: This appears in the region directly below the title on the pass. It consists of the second “#|##|###” tag in the markdown body. The preferred length of the secondary field is 25 to 35 characters. Other details of the campaign: This appears directly below the description field on the pass. It consists of the first non-empty line without any tag in the markdown body. The preferred length of the auxiliary field is 40 to 50 characters. QR code: The QR code appears at the very bottom of the pass. Scanning this code will direct the user to the the markdown card URL where they can access the call-to-action button again. Text color: The color of the text inside the pass is either black or white and is automatically chosen based on the background color. Step 1: Click on the organization name at the top right corner of the Beaconstac dashboard. Step 3: Under Account Details, click on the “Wallet Support” radial button to toggle between “on” and “off”. Step 4: Click on “Save” to save your settings. Apple Wallet has now been enabled with your markdown campaign! With these simple steps, you can now enhance the user experience with your markdown campaign. This feature ensures that consumers have easy and convenient access to your offers, tickets and coupons. Additionally, if a user enters the proximity of the beacon again, they will receive a notification that reminds them of the pass that has been saved to their Apple Wallet and can entice them to enter a store or redeem the offer available to them. What happens on an Android phone? While there is no similar application for Android phones, we offer an alternative solution. Instead of the Apple Wallet feature, we provide an option on Android phones to “Save on Your Device”. In this case, it is necessary to attach the QR code on the markdown card itself. If a user saves the markdown card as a pass, a screenshot of the same containing the QR code will automatically save onto the smartphone gallery. Scanning this QR code will direct the user to the markdown card URL, where they can access the campaign anytime and from anywhere.